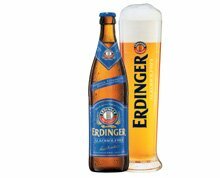 Athletes have long known that a cool glass of ERDINGER Alkoholfrei not only tastes fantastically full-bodied and refreshing, but is also healthy – due to the vitamins and polyphenols it contains. Thanks to its isotonic properties, it provides the body directly with valuable ingredients and thus satisfies thirst even faster. The non-alcoholic drink from Erding is not only a real energizer but also low in calories, with only 125 kcal per 0.5-litre bottle, and made exclusively from natural ingredients. Just one bottle of ERDINGER Alkoholfrei a day makes an important contribution to a healthy diet. Alkoholfrei has minimal alcoholic content of less than 0.5% vol. For decades, beers that contain less than 0.5% vol. alcohol have been referred to in Germany as non-alcoholic! But why is this? Such minimal alcohol content is completely safe. Several academic studies have proven this – most recently a study in 2010 conducted by the Institute for Forensic Medicine at the University of Freiburg. “Non-alcoholic” has become an established term: whether sport, work or driving, it’s always safe to drink non-alcoholic beer. “Non-alcoholic” means that such beers are free of any alcoholic effect. By the way: a number of foodstuffs have comparable levels of alcohol content: such as organic fruit juices, kefir and even over-ripe bananas. Further information at www.erdinger-alkoholfrei.de.